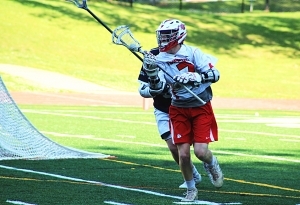 An historic first home playoff game for the Dunwoody Wildcats lacrosse team did not go as planned as North Paulding ran away to a 12-3 Class 6A-7A victory at North DeKalb Stadium on Wednesday. Riley Cole scored four goals to lead the charge for North Paulding (7-9) including one of two goals by his team in the final 37 seconds of the first quarter to take a 4-1 advantage into the second period. Carson Bregitzer scored the Wildcats (9-5) only goal of the first quarter. Connor Brogdon pulled Dunwoody within 5-2 with a second period (4:22) goal on an assist from Sean Fox. North Paulding answered quickly as Cole got a one-on-one at the goal to make it 6-2. Kyle Light scored the first of his two goals of the night with 1:37 left in the half to make it 7-2. Cole and Light would each score one of the three goals for North Paulding in the third quarter as the lead grew to 10-2 with Light scoring in the final second of the period. Cole opened the fourth quarter with a goal in less than a minute of playing time as North Paulding continued its march to the 12-3 win. Coach Montez Swinney’s Lady Wildcats (8-8) also reached the Class 6A-7A state playoffs for the second consecutive season as a 5-4 win over Norcross sealed the playoff berth. The Dunwoody Lady Wildcats ended their season in the first round of the state playoffs for the second consecutive season as well with a 17-0 road loss to Kennesaw Mountain (13-6).